Ok guys I’m sooo excited for today’s highly-requested blog post! As I was writing this last night, I realized this was going to be a super long post, so I decided to split it into two parts: lunches and dinners. Today I’ll be sharing some of my favorite lunches, and next week I’ll be back with part two: my favorite dinners (someone also suggested that I also do a “What I Eat in a Day” post every week with different recipe ideas and I will probably do that as well!). I rotate between a lot of different lunches every week and it was pretty tough to narrow it down to five of my favorites, so these are the lunches that I eat most often. These are all SUPER easy to make and oh-so healthy! Even if you eat meat, it’s incredibly beneficial to incorporate more veggies into your diet. And not just any veggies! I choose organic veggies whenever I can, since non-organic fruits and veggies are treated with pesticides and contain GMOs (genetically modified organisms). When I stick to a non-processed, plant-based diet, I notice a huge difference in my mood, mental clarity, and even my skin. So let’s get started! I love this pasta salad, and so does my husband! It’s FILLED with veggies and is also made with Banza – pasta made completely from chickpeas. 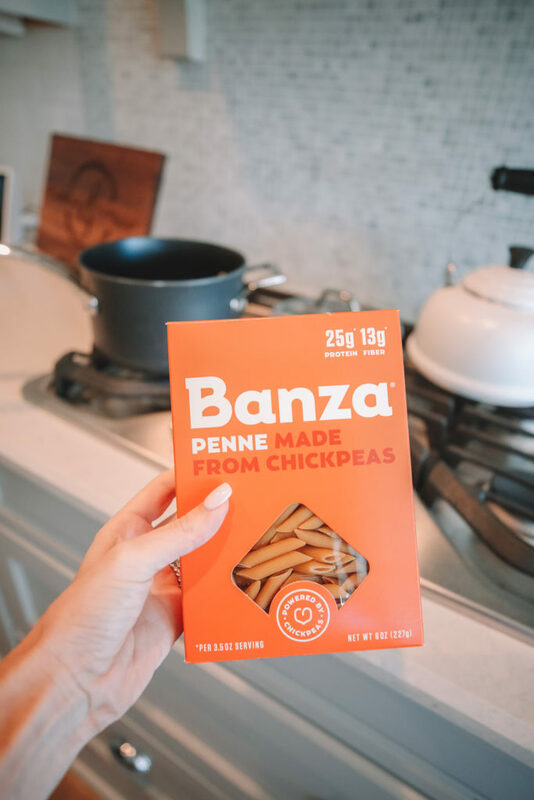 It tastes EXACTLY like pasta, but the only ingredient is chickpeas, therefore it’s gluten-free and contains loads of plant-based protein. I like to buy organic veggies whenever possible, so I load this baby up with organic veggies. 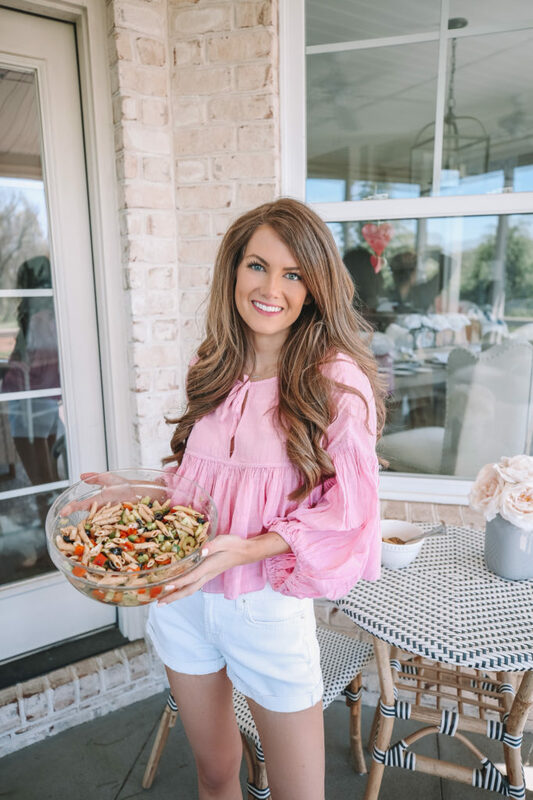 I also like to make my own Italian dressing – it’s way easier than you think, and you can avoid all of the preservatives in store-bought versions. My husband really likes to add cheese (especially feta), so I would definitely throw some in if you’re a fan! Feel free to switch it up as well, you can literally add in ANY vegetable you want. We usually make this on Sundays and serve it for lunch all week long. Start by boiling water and tossing in the box of Banza pasta. 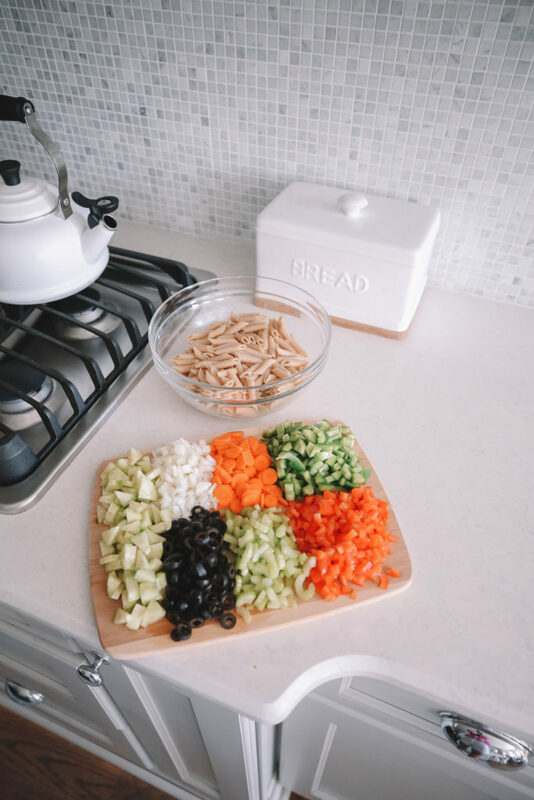 While the pasta is cooking, chop up all of the veggies into small, bit-sized pieces. Once the pasta is done cooking, drain the pasta and rinse with cool water. Combine everything in a large bowl. For the Italian dressing, I like to make my own without preservatives! I mix 1/2 cup of olive oil, 1/4 cup of red wine vinegar, 2 cloves garlic (minced), 1 teaspoon dried basil, 1 teaspoon dried oregano, 1/2 teaspoon ground mustard seed in a sealed jar and shake until mixed. Then I pour it over the pasta salad, stir to combine, and refrigerate for 15 minutes before serving. This pasta salad will last several days in the refrigerator and tastes great leftover! The only real prep work for this recipe is baking the sweet potato (which, unfortunately, can take up to an hour!). You can either cook the sweet potato ahead of time, or if you work from home, go ahead and turn your oven on about an hour before you plan on eating. My favorite way to eat a sweet potato is to chop it up in small pieces and bake it in the oven with a little olive oil, chili powder and black pepper. The actual salad recipe is super simple: mix together your salad greens (the darker green, the better! ), quinoa, cucumber, grape tomatoes, and fresh parsley, and top with the baked sweet potato and sliced avocado. I usually juice a lemon on top for extra flavor, or I’ll mix together the lemon juice with hummus for a homemade dressing. It also helps to have cooked quinoa already in your fridge – I usually make a big batch on Sundays to have on hand throughout the week! 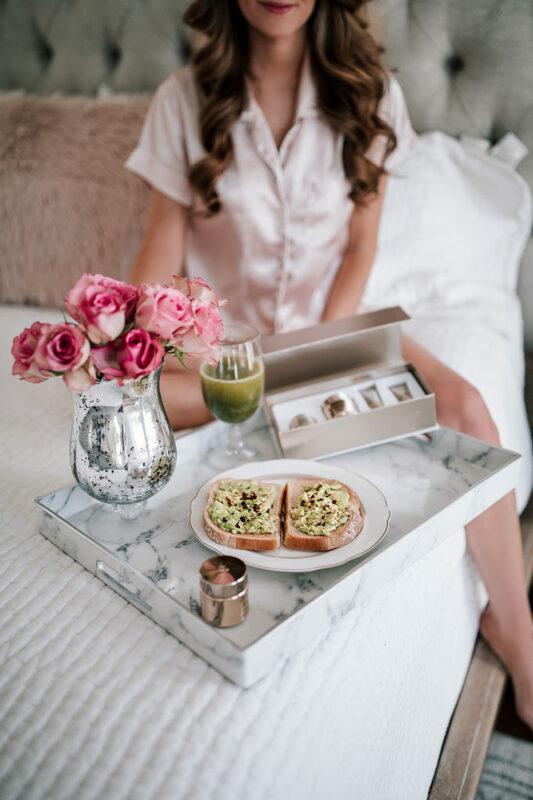 Avocado toast is an awesome lunch because it’s filled with healthy fats, and the sprouted whole-grain bread will keep your blood sugar stable and your tummy full until dinner time. Plus, this one tastes SO good! When I have this for lunch, I usually serve it alongside a big bowl of fruit, a green smoothie or some steamed veggies. This one is super easy! Start by putting two slices of Ezekiel bread in the toaster. While the bread is toasting, you can slice the avocado in half and begin scooping out the insides. When the bread is done toasting, put half of the avocado on each slice and smash it down with a fork until you get the desired consistency. Top with Trader Joe’s Everything But the Bagel Seasoning Blend (just trust me on this – it’s soooo good!). *Side note: I wanted to explain the difference between normal white bread and sprouted bread! The sprouted grain process is different than white bread or even whole grain bread; it involves soaking the grains in water until they grow a sprout. 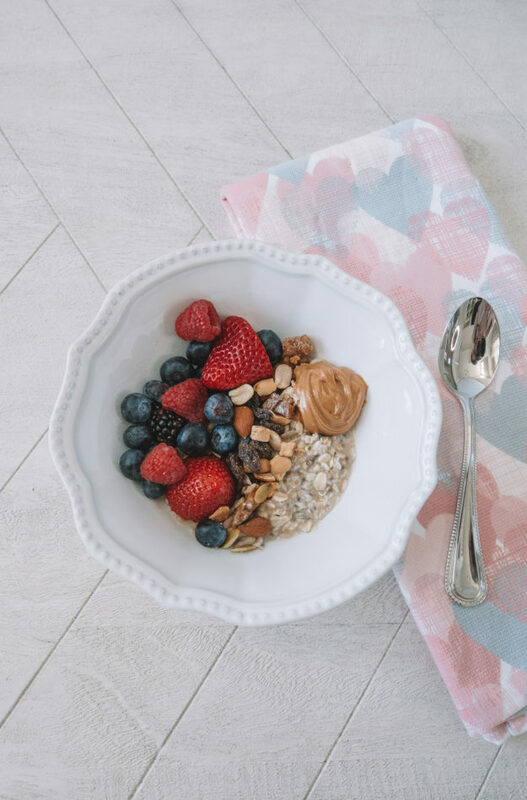 Enzymes are released during the sprouting process, which break down proteins and carbohydrates and helps make sprouted grain food low glycemic and easier to digest. Traditional grain breads are harder to digest, and the body loses a good portion of the nutrients because it is unable to digest them. Sprouted grains also contain more vitamins, minerals and antioxidants than whole grains. The classic Ezekiel 4:9 Sprouted Grain Bread is made from six organic sprouted grains and absolutely no flour! It contains all nine essential amino acids, which makes up a complete protein. I’ve already blogged about my green smoothie recipe before, but I thought it was worth sharing again because I make it and eat it so often for lunch! Add everything to your blender in the order that it appears above, and blend blend blend! I love drinking it out of a big ol’ mason jar with a glass straw. If I have this for lunch I’ll usually eat something else along with it, like some leftovers from dinner the night before or some raw almonds, walnuts and cashews. 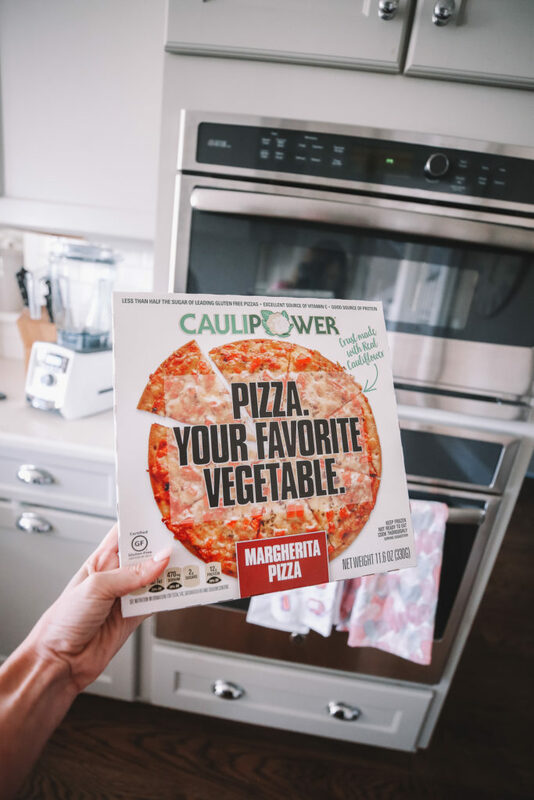 This last one is not really a recipe, but it’s my favorite brand of cauliflower-crust pizza: Caulipower Margherita Pizza. This is my go-to on super hectic days, it comes frozen so all you have to do is preheat the oven and pop it in for 10 to 15 minutes – it’s SO good! The crust is made of real cauliflower (therefore loaded with Vitamin C, fiber and B vitamins) and it’s naturally gluten-free. Plus, the pizza is lower in calories than most frozen pizzas – you can eat an entire half of the pizza for only 330 calories! My favorite flavors are the Margherita Pizza and the Veggie Pizza (although this one is harder to find!). I buy mine from a local Harris Teeter. To find out where it’s sold near you, you can type in your zip code here for a list of stores. Thank you so much for sharing! I’m definitely gonna save this post and try it out myself. Totally trying so many of these out next week!! Thanks for sharing! I just discovered that Ezekiel bread last week. I’ve been having the cinnamon raisin one for breakfast! Oh my gosh, these all sound and look delicious! Thanks for sharing Cait! That pasta brand and the pasta salad sound so good- I might make that!! Loved this post! I definitely want to try out the sweet potato and spinach bowl. So many yummy meals! definitely want to try out that pasta! That cauliflower pizza is so unhealthy… did you check the ingredients?? Yes I checked them! Of course I would rather eat 100% unprocessed foods and make my own cauliflower pizza crust from scratch but that is not realistic for me and my family’s hectic schedule. 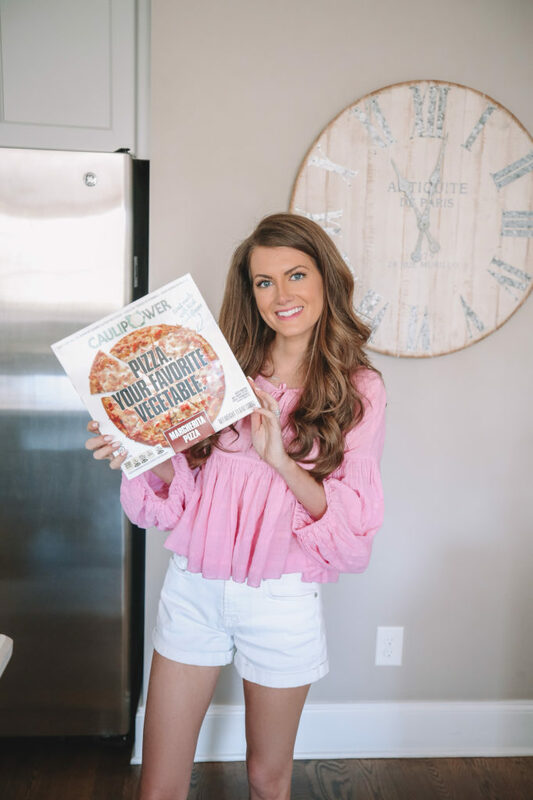 I don’t see anything wrong with having a frozen pizza once in a while, and this one is a much healthier alternative than the other frozen pizzas you’ll find at the grocery store! I read How Not to Die per your recommendation and have switched over to mostly whole foods/plant based. What are your thoughts on absolutely no eggs or cheese? It’s so hard sometimes!!! I have to try that pasta! Definitely giving these a try. I am currently during Sakara and LOVING it! Where is that marble tray from? Love these lunches! My boyfriend and I love the cauliflower pizza and you’re right, it’s a super easy fix and helps when you miss pizza! 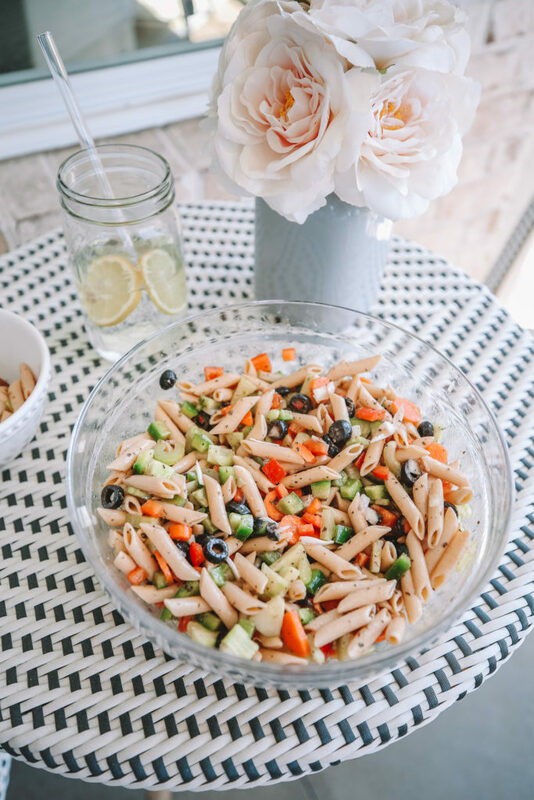 Definitely going to be trying that pasta salad – it looks delicious!! Thank you for sharing – I can’t wait to see what is on the favorite dinners post! Thank you for all of your recipes! It’s so fun to find new, healthy things to cook and I’m a health eater just like you! Pasta salad is my guilty pleasure meal, but I feel SO bad about eating a giant bowl of carbs. I’m going to have to try that chickpea brand! I definitely need to try all of these recipes! I’m not much of a meat eater, so I’m always looking for easy recipes to make. I have such a hectic schedule that I honestly don’t have time to make intricate meals! I love how simple, yet super filling these are! Thanks so much for sharing… I can’t wait to see your dinner meals! Thank you so much for sharing! I’ve been vegetarian for about a year and I’m always looking for new recipes.